Home » Our Doctors » Jonathan E. Stine, O.D. 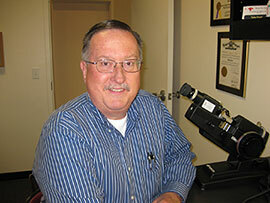 Dr. Stine, was raised in Sierra Madre, California and graduated from Pasadena High School. After graduation, he spent four years in the U. S. Air Force, with one year served in Thailand. Dr. Stine received a Bachelor of Arts from University of California, Santa Barbara and a Bachelor of Science, as well as a Doctor of Optometry degree, from Southern California College of Optometry in 1983. Dr. Stine is a member of the Washington Association of Optometric Physicians, the American Optometric Association, and the Contact Lens Section of the American Optometric Association as well as having been a charter member of the Eye Care Centers of America Doctor’s Advisory Panel. Dr. Stine has had extensive training in fitting difficult to fit contact lenses, co-management of Lasik and PRK, and co-management of cataracts. He is instrumental in the diagnosis and treatment of dry eyes, glaucoma, eye infections, ocular allergies, and foreign body removal. In his spare time Dr. Stine enjoys spending time with his family, golfing, reading, tearing into a tough N.Y. Times crossword puzzle, and mastering the fine art of cooking low and slow barbecue.